Alone. Together. Fact. Fiction. : Pride And Prejudice - Jane Austen. Pride And Prejudice - Jane Austen. The novel is written in third person but is more or less in the point of view of Elizabeth Bennet, second eldest of the 5 Bennet girls. The story opens with a new neighbour renting a house near the Bennets, Charles Bingley an eligible young single man of five thousand pounds per year. 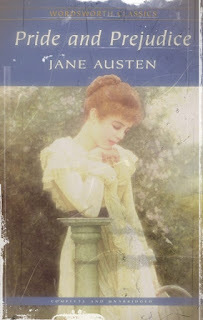 The rest of the book is tender chase between Jane, the eldest Bennet girl and Bingley, who are separated by circumstance and the "helpful" advice of Bingley's friends and family, who find the Bennets unsuitable. "The more I see of the world, the more am I dissatisfied with it; and every day confirms my belief of the inconsistency of all human characters, and of the little dependence that can be placed on the appearance of either merit or sense." The friend who helps Bingley in this matter is Fitzwilliam Darcy, perhaps the most famous English literary character of all time. Darcy, the brooding, thoughtful friend becomes quite taken by Elizabeth, and in their chance encounters finds himself being slowly beguiled by her. However Darcy is thought of in quite a different manner by Elizabeth herself, who has heard accounts of Darcy which paint to be a very prideful, arrogant person, that is until Darcy shows Elizabeth his true character in many ways, leading to happy endings all round. Why I love this book...there are many reasons. Firstly I really do just love and admire Jane Austen, she and the Bronte's will forever be some of my favourite authors of all time because they wrote at a time where it was not a commonplace thing to be a female writer, let alone be a female with any kind of profession. Secondly the characters are written so well, and that kind of applies to all of the characters in the book, which is a hard thing to do: create so many wonderful deep characters without taking up the whole space of the novel implementing their back stories. I would absolutely recommend this book to everyone, I think I read it first when I was around 11 year old and I go back to it around once a year (and if I'm honest could probably talk along with the film word for word) It's just such a great story with such lovely entertaining characters, definitely a worthwhile read if you've never picked it up.